For those of you that don't know, I work in MQ. From time to time, I find myself at work earlier than normal, and hungrier earlier than normal. And so occasionally I take my lunch break a littler earlier and I seem to really enjoy scrambled eggs. For me it satisfies my hunger and well I just happen to like scrambled eggs. The thing is though, until recently, I've never found anywhere around MQ (or Shatti for that matter) that prepares scrambled eggs how I like them. I could be a bit pig-headed here and say that no restaurant here prepares scrambled eggs properly, but I know there are people who enjoy rubbery scrambled eggs, those weirdo's. You see, for me, scrambled eggs are supposed to be soft - not runny though. As opposed to something that if I were to drop on the floor they'd bounce back up at me. 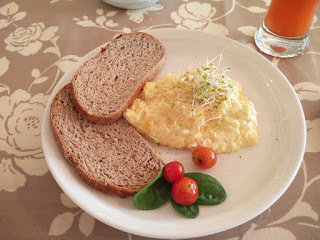 For me, scrambled eggs should be soft, light and fluffy. And certainly not rubbery. I've tried a ton of different places in and around MQ over the years for their scrambled eggs, and they've all been the same inevitable result - over-cooked, in fact in one place the scrambled eggs were so overcooked I needed to actually use a knife to cut through them as they'd sort of burned on the pan I guess. Gross - and I have never gone back to that particular place since as it happens. Now I know I'm only talking about scrambled eggs here, it's hardly like it is a major thing, but I firmly believe in sharing a good thing when found, and I am very happy that I've finally found a good spot to get scrambled eggs. I assure you that I've not received any compensation of any kind from this place. I've been going here for scrambled eggs for 4 months or so, and they've been consistently good over that entire time. For those days where I am craving a good scrambled egg fix, I head to the Crafty Kitchen in MQ. They cost about RO 3 and it comes with 2 pieces of toast. A little on the expensive side perhaps but delicious none the less. So, if like me, you happen to like proper scrambled eggs and you're craving a fix (and don't have the luxury of going home and doing it yourself) then you could go and check out the Crafty Kitchen's scrambled egg situation. To be honest, I've not really had much else to eat from Crafty Kitchen, I just seem to go there for scrambled eggs - so I'm not endorsing the restaurant as a whole, but for scrambled eggs - hell yeah! Click the links for Crafty Kitchen's Website, Facebook & Instagram. You can call them on +968 2469 6660. Sythe, have you by any chance been losing blog visitors over the last year or so?! Actually traffic was up, but I took June, July and half of August off, so now I'm rebuilding some of the traffic loss... used to average around 100-120k/month but after 2.5 months of neglect it dropped to 40k, last week alone saw a spike so last 30 days' of traffic is now at 55k. I'll be happy when I get monthly traffic back up above 80,000 a month.